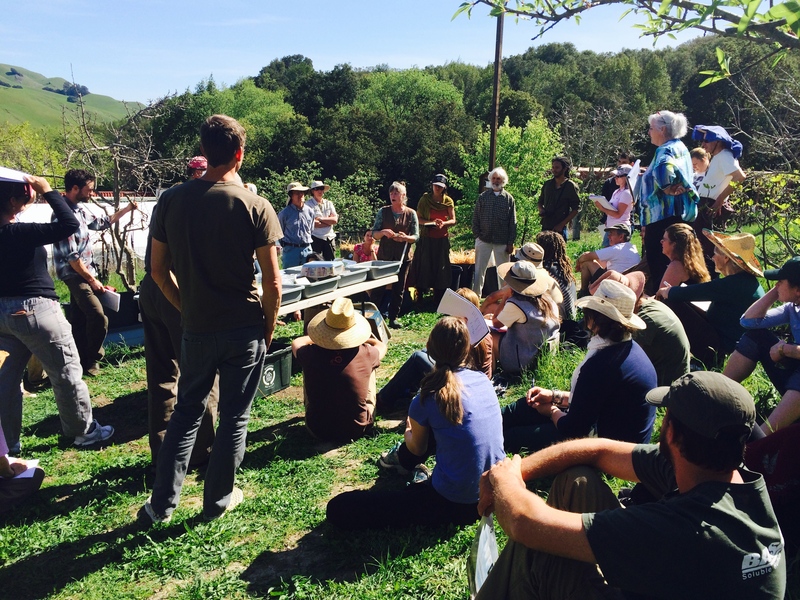 This was the culmination of a five-day workshop in March, 2014, held on Green Friends Farm. 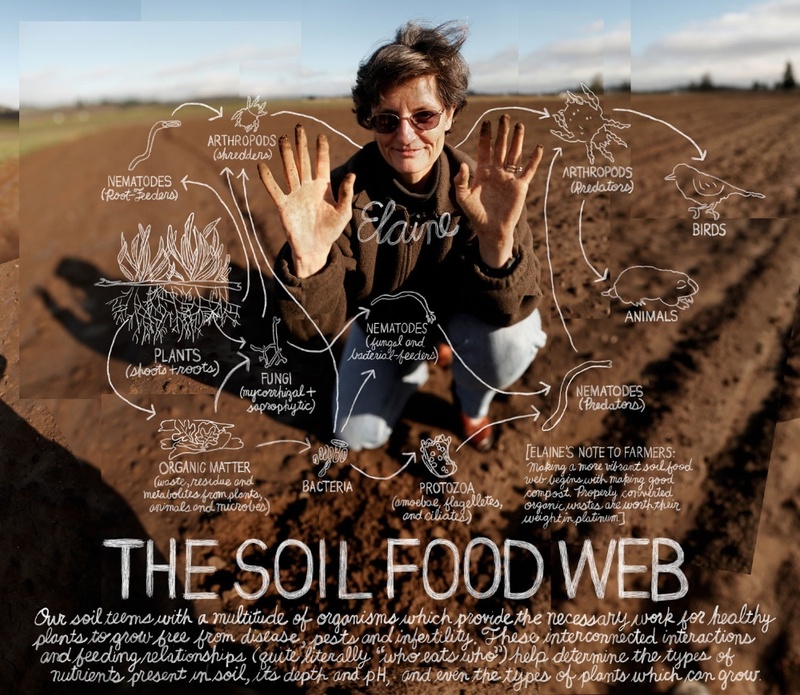 It was taught by Dr. Ingham, a soil biology researcher and the founder of Soil Food Web, Inc. Dr. Ingham has been a leader in the field of sustainable soil science for over 25 years. 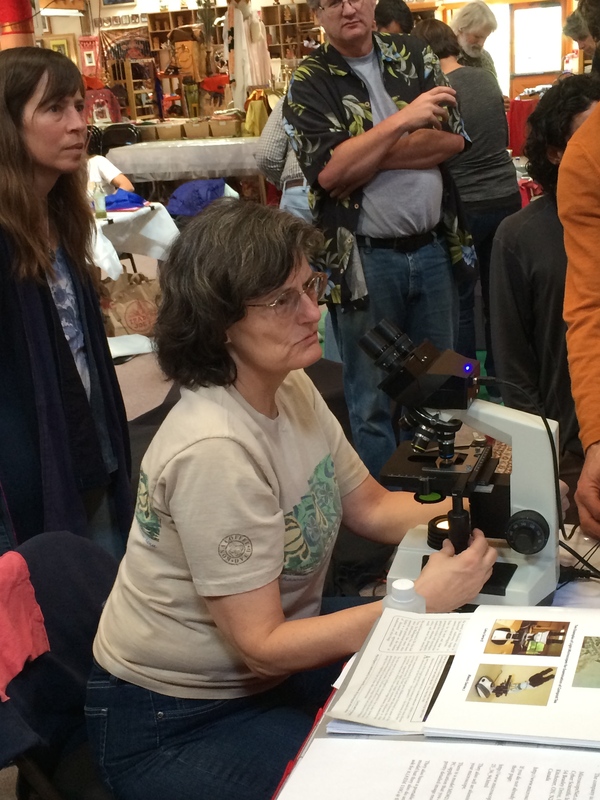 The workshop focused on the soil food web, or the intricate network of organisms above and below ground that provide the basis for all plant life on earth and therefore most life. 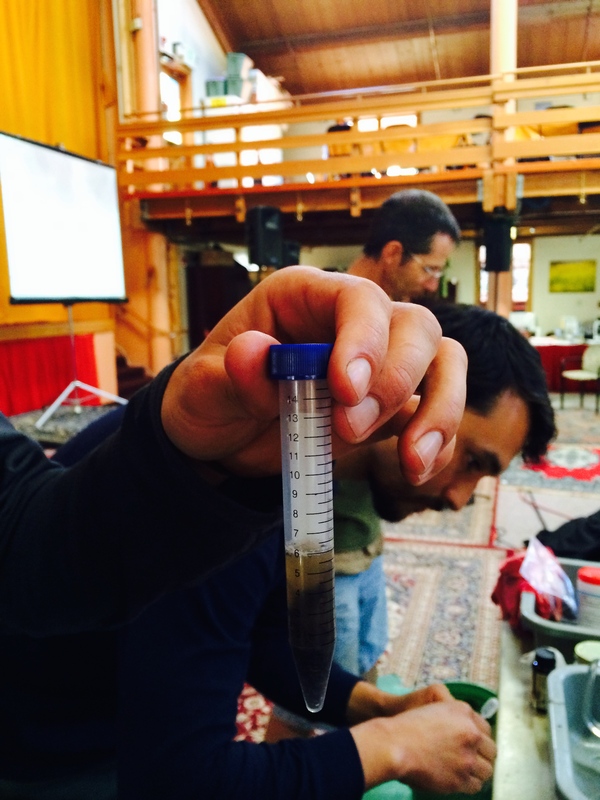 The 5-day Soil Food Web workshop featured hands-on lectures on the soil food web, composting, compost tea and more. On the last day people brought soil samples from their farms, their gardens, or just went outside to collect samples from the orchard. Putting those soil samples under the microscope was proof that everything they had learned in the past few days was true. The soil is alive. Most people don’t realize that the soil beneath their feet is teaming with life. A mere teaspoon of garden soil can contain up to 1 billion bacteria, several yards length of fungi and thousands of protozoa. Before you start getting squeamish, understand that beneficial soil microorganisms are not human pathogens. In fact, they outcompete human pathogens, such as E.coli, that might be harboring in the soil. The soil food web is directly involved in getting nutrients from the soil to the plants and eventually to you. Plants convert sunlight into sugars through photosynthesis. The plants then secrete these sugars through the roots as exudates. Exudates are simply compounds that are secreted from the roots to feed the bacteria and fungi. Or as Dr. Ingham puts it, they are the “cakes and cookies” the plant puts out to lure in the bacteria and fungi that provide nutrients for the plant. The bacteria and fungi extract nutrients from the soil and decompose organic matter. They help keep nutrients in the root zone so that they are available to plants. They also enhance soil structure by binding soil particles into aggregates, thereby improving the flow of water and oxygen and preventing waterlogged, anaerobic soil where these beneficial organisms cannot survive. Enhancing soil structure prevents soil degradation and erosion. They also serve as a food source for other members of the food web. Protozoa, nematodes, microarthropods and earthworms are considered predators in the soil food web because they eat the bacteria and fungi. This causes the release of the nutrients stored in the bacteria and fungi, in a soluble, plant available form. Because they are larger organisms, they further improve soil structure by burrowing and creating air and water passages. They also enhance decomposition of organic matter and mix it into the soil. And of course, they are food for larger creatures such as birds and small mammals. That is all very fascinating, right? But why does it matter to you? When plants have the nutrients they need, made available by the soil food web, inorganic fertilizers are not needed. In addition, toxic pesticides and herbicides are un-necessary because beneficial organisms, or “the good guys,” as Dr. Ingham puts it, outcompete plant pathogens. Pesticides not only destroy plant pathogens, but also destroy the biology of the soil, essentially turning it into lifeless dirt, devoid of nutrition. This is why inorganic fertilizers are often added. However, these fertilizers are washed away because there are no beneficial organisms to grab onto them and keep them near the root systems of plants. If the soil food web is not functional in the soil, the plants will not be able to access nutrition and therefore neither will you. Establishing, or in many cases reestablishing, the soil food web is not difficult. Even better, it is cheaper than using conventional fertilizers and pesticides. The key is to feed the microbes that feed the plants. It simply requires some good compost. On day three of the workshop, participants trooped out into the bright afternoon sunshine and gathered on a hillside covered in blooming apple trees. 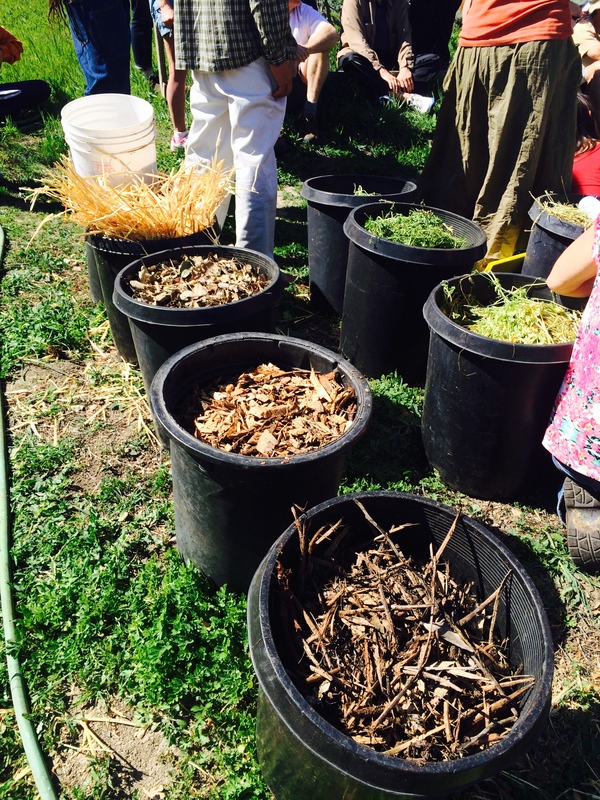 They examined components of a good compost mix: woody material for fungi, green material for bacteria and organic material high in nitrogen, such as legumes. Good compost should not smell bad and should have a rich dark color. “It should look like dark chocolate, not milk chocolate,” Dr. Ingham had said earlier that morning, as she showed a picture of a dark chocolate bar beside finished compost. Farmers used compost to increase fertility in agriculture at least since the time of the Romans and probably before. It has only been in the last century that it was largely replaced by chemical fertilizers and pesticides. Awareness about the benefits of compost is slowly returning to home gardening circles, but it is still not used in most large-scale agricultural productions, where most of our food comes from. “Imagine your favorite plant,” Dr. Ingham asked the workshop participants. “Can you picture it in your mind? Can you describe it? Does the picture of your favorite plant include the roots? For most people it does not.” Several people chuckled. She was right. After several days learning about the importance of the biology below ground, only 4 of the sixty participants imagined the root system of their favorite plant. This requires a paradigm shift, Dr. Ingham explains. Life above ground is directly intertwined with life below ground. Her favorite plant, the baobab tree, has roots that go as far as 150 feet. Some root systems are known to go as deep as 500 feet. Microorganisms that increase the porosity of the soil increase the water-holding capacity of the soil. This allows roots to go deeper and reduces or eliminates the need for irrigation. This is incredibly important for drought-stricken places, like California. Dr. Ingham has worked to restore the soil biology with large and small-scale agricultural operations on 20 million acres around the world. Time after time she has seen yields increase and production costs reduced. The entire food web must be present. It is a holistic system. Nutrient retention cannot happen without the fungi and bacteria in the root systems of plants. In order for those nutrients to be made available to the plants, protozoa, beneficial nematodes and microarthropods must be present. All of these organisms work together to enhance soil structure so that oxygen and water can flow freely. The roots will grow deeper and the plants will be healthier and so will you. At the end of the last day of the workshop, there was a pile of dark chocolate at Dr. Ingham’s desk. Participants had given them to her in homage to her compost identification system. Good compost is the color of dark chocolate. Good compost will bring the life back to the soil. Dr. Ingham tells the participants to go forth and spread this knowledge as she hands out chocolate squares. “And get data!” she repeats again and again. It is her mantra. After all, she is a scientist. Only with data—before and after pictures, records of compost applications and microorganism counts—can this biological method become more widespread. Dr. Ingham has turned these farmers, these ranchers, these back yard adventurists into scientists. Once you have looked through the microscope and seen the life in the soil, there is no going back.